​In this issue of the Spring 2018 Gordon Art Place Newsletter I am presenting a new departure within my sculptural repertoire, welded steel & found object sculptures, the first two of which are shown below. In addition, I share my newest works painted with Acrylics, and tell you about a new venture on surrealism, including an international art magazine exploring various aspects of current day expressions on surrealistic themes. In addition, see the details about my Semi-Annual Spring Open Studio on the First Weekend in May. Aside from new and other works in the collection, a selected group of my etchings from the 1980's will be shown. Blue Springman 46" X 22" X 12"
Fluorescent Man 42" X 23" X 12"
​The process for developing these Welded Steel Sculptures is partly dependent on what kinds of interesting steel objects I can find. So I invite you to help me find interesting castoff and "found-object" pieces of steel. Old springs - as in the Blue Springman; interesting shapes, old gears or wheels, any kind of formed or shaped steel. All sorts of anything steel. I can not use galvanized or corrugated steel. Painted steel is OK. In the sculpture I produce, some spots are welded, some are riveted, some are held together with wire or even special glue. The Fluorescent Man is welded and painted steel with acrylic paint. Blue Springman is a "found- object" sculpture, left as is. The type of welding I am doing on these sculptures is MIG welding. The Acronym MIG welding is short for “metal inert gas” (MIG) welding, a form of metal arc welding. An “arc” in layman terms is a short circuit. In welding one is using the gap between two metal pieces (electrodes) to “catch” the energy of electricity to melt and join two pieces of metal so they become one. Carbon steels melt at approximately 2400 to 2700 degrees Fahrenheit. To reach these temperatures quickly, the welding wand (sometimes called a gun) temperatures must reach 5000 to 20,000 degrees Fahrenheit to achieve the metal melt. In order to avoid a contaminated weld joint, an inert gas is used to shield the weld. The inert gas source can be either in the form of a mixture of CO2 and Argon, - oxyacetylene or a flux core wire (the flux core produces the inert gas when the metal surrounding it melts). What is my motivation to work in welded steel? Diversity of media, size, challenge. Working with welded steel is different from painting or molding clay and making bronze and other sculptural media. I can vary size from small to very large. Most important is the challenge first of finding appropriate pieces to use in the artwork, then to visualize an image and produce a finished object out of diverse and disparate forms. Making something out of nothing. I am also motivated by the environmental benefit. Creating art from scrap and trash! Wouldn’t you like one of these artworks in your home or garden? "Exotica" Acrylic on Canvas 30" X 24"
"Pride" Acrylic on Canvas 30" X 24"
"Purple Hand Red Flowers" Acrylic on Canvas 30" X 24"
"Chesire Grin" Acrylic on Canvas 30" X 24"
The VOYZX Fine Art Project is committed to opening and developing new opportunities for artists coming from surrealist traditions, to support and help them to take their career to the next level. 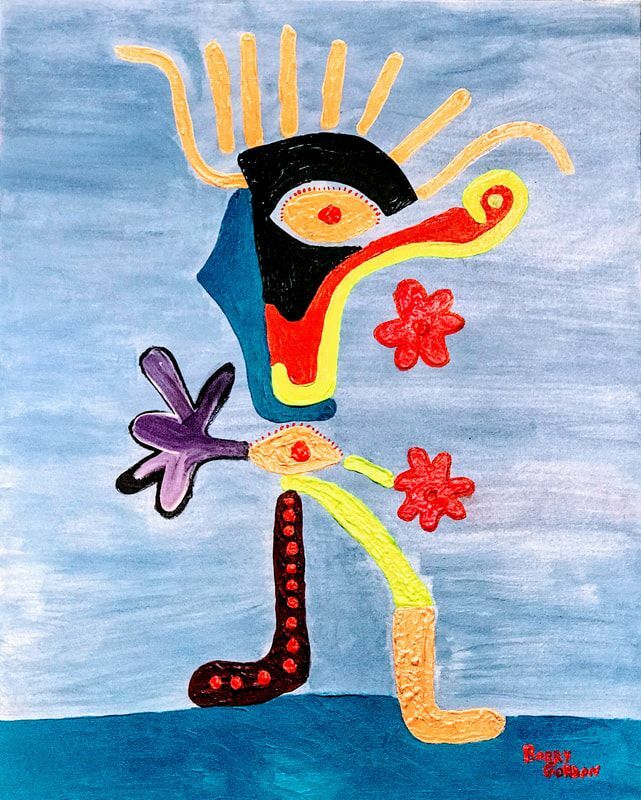 ​Voyzx Contemporary Fine Art Gallery – represents people who create thought-provoking artworks.Our artists work in their own unique styles, derived from and further developing traditions of surrealism, Dada, surreal expressionism, abstraction, and conceptual art. We tend towards whimsy rather than dystopian perspectives. A limited number of artists are selected to participate in International-level Art Fairs, and potential museum, and other institutional venues. This part of our program includes the development of exhibitions for regional museums, universities, colleges and other institutions as well as the participation in a select group of international art fairs in such venues as Toronto, New York, Miami and other prime art markets. Artist publications – Still under development, this program involves the publication of books, albums, catalogs, etc. for artists and others. Every publication will be submitted to the Library of Congress (USA) and Library and Archives of Canada, as well as the catalogues that go to art departments for automated purchasing. Advisory and marketing services for artists – Services available to a select group of artists. The Voyzx Fine Art Project is based in Metropolitan Vancouver (Canada) and has exhibiting gallery venues in Vancouver, Montreal (Canada) and by arrangement with other venues in the United States. We are an international organization, drawing our participants from Canada, the United States, Mexico and South America, as well as Europe and all parts of Asia. As you all know, we are living in precarious times. There is turbulence in the market and the world is becoming radically different from what we have all known in the past. The strange thing about art in all of its various forms is that it is intellectually satisfying and therefore and thereby reassuring. When you possess a meaningful piece of art, each time you look at it, it stimulates your intellect and emotions and nourishes you and your environment. The image reverberates in your mind. Your favorite piece of art will stay with you. ​Buying art for your friends is a great gift. Buying art from your artist friends is also a great gift. ​It is time for my semi-annual Open Studio. This event will be the first weekend in May (5th and 6th), Saturday and Sunday afternoon from 2 to 4:30 PM. Please plan to stop by for a look at recent and other works from the collection. On display and for sale will be a collection of my bronzes and new cast marble sculptures from the "menagerie" series, pen and ink drawings, rarely seen etchings, new acrylic paintings on canvas, available oils on canvas, and some new welded steel sculptures. Also on special sale are selected etchings from the 1980's. I need your help to make space for new art work and need to sell some of my framed etchings at scandalous prices with deep discounts.